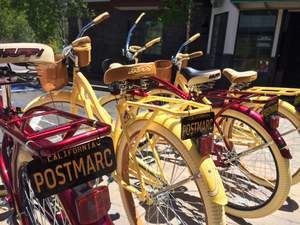 LAKE TAHOE, CA--(Marketwired - Jun 2, 2016) - The Postmarc Hotel & Suites, the hotel known for its convenient, comfortable and affordable South Lake Tahoe hospitality, announced today a host of new amenities for hotel guests. Beginning July 1st, the Postmarc will make available a set of 'Ten Six Classics' stand-up paddle boards (SUPs) which can be launched at the Ski Run Marina across the street, a brand new fleet of Deluxe beach cruiser bikes for guests to explore South Lake bike paths, as well as portable beach chairs to take to the beach across the street from the hotel. "At the Postmarc we are dedicated to making our guests' stay as comfortable and convenient as possible, and equally as important, we want to help them have fun," said Charles German, owner of the Postmarc Hotel. "I think Lake Tahoe is one of the most beautiful places in the world so I am happy to celebrate our first year in business. With summer upon us we are pleased to make our new cruiser bikes, SUPs and chairs available at no charge for guests to maximize their adventure while staying with us." Brand new complimentary crusiers for Postmarc guests for a Lakeside ride!